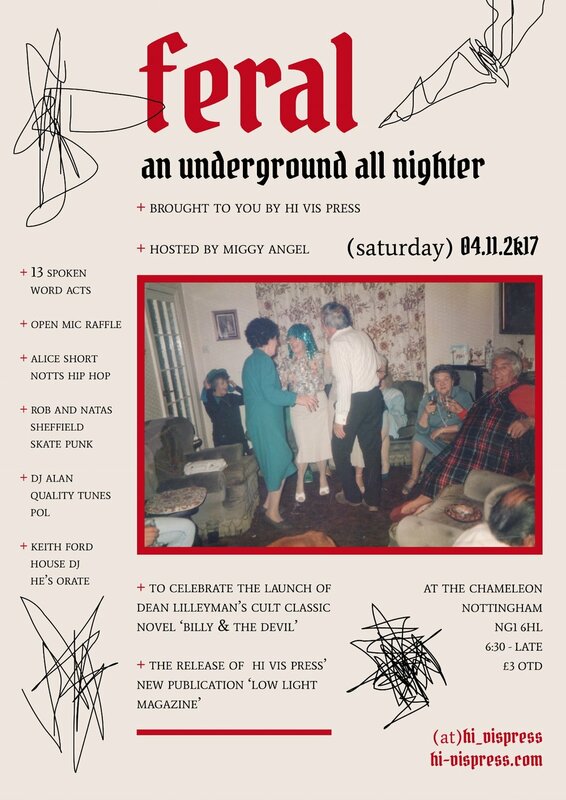 On 4th November 2017, Hi Vis Press bring you FERAL, an underground all nighter (well, till 2 am). It will be at The Chameleon Arts Café, NG1 6HL, with doors opening at 6pm and the first act on at 7, hosted by the one and only Mr Miggy Angel. The night will be celebrating the launch of Dean Lilleyman’s cult classic novel, Billy and the Devil. It will be the first novel that we’ve published and a statement piece as to what we’re all about. The novel is an unflinching portrayal of the life of an alcoholic: Billy. It accelerates at a rapid pace, is experimental in form and transgressive in tone. Find more about the book here and even take a read of the chapters online. The other new publication that you’ll be able to get your hands on is the first issue of our new poetry, prose and photography magazine, Low Light. 24 writers and photographers alongside interviews with the brilliant Jim Mortram and Jenni Fagan. More on this is here. The night will consist of 12 of our favourite writers (one has had to pull out since the poster was made, unfortunately) reading their work; expect poetry, stories and more but don’t expect any refrain. The writers we feature don’t shy away from the truth. Half way through the night, Alice Short will be performing a set. Her unique hip hop will be accompanied by acoustic guitar, Alice is a gem in Nottingham’s music scene. Rob and Natas will be topping the live entertainment off. The Sheffield band bring the raw garage punk, skate vibes, perfect to get us going again and into party mode. Then it’s a case of partying all night. DJ Allan (also one of Sheff’s finest) will be spinning some vinyl bangers and the house DJ Keith Ford will be belting tunes for the rest of the night. For anyone who wants to be a part of the fun, just turn up on the night (tickets on the door only. £3 - a bargain for all that!) and you’ll be welcomed instantly to the most inclusive and down to earth literary night there is. It’s by the people, for the people! There will also be an open mic raffle for only a quid extra if anyone fancies reading some words out, so bring a poem with you just in case. We’re limited on time for this one though so unfortunately it’s only one poem per person or story if it’s mega short. The 4th of November will be a landmark day for true Notts DIY publishing and real, unapologetic literature that stands on its own without the need for any funding or endorsement by any transparent organisations.